I have to say that Jim Dixon's commitment to grilling or, as he would say, cooking with fire, is pretty close to matching the obsession that my husband, Dave, has with the flame. So when one of them offers advice on improving and/or expanding on your fiery repertoire, it's best to prick up your ears. 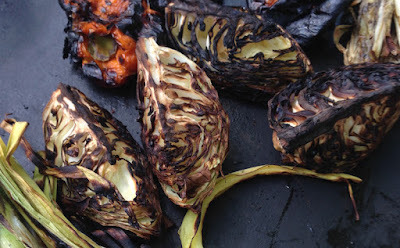 While fire and food have been part of the human experience for millennia, cooking over burning embers still offers surprises, like the charred cabbage I ate last week. More on that below; the first step is is the actual fire. One of my favorite quotes says everything: "The first thing, if you have a gas grill, is get rid of it," said Donald Link. The standard Weber works great, but so does a backyard fire pit with a grill. Some kind of cover comes in handy for longer, lower heat cooking, but it's not absolutely necessary. I burn a mixture of real wood charcoal (sometimes called lump briquet even though it's not the same as the standard charcoal briquet) and hardwood, usually a mix of oak and frutwood trimmings from my backyard trees. Whatever you burn, don't use lighter fluid to start it; get a charcoal chimney. Start your fire, spread it out in your Weber (or whatever you're using), and let it burn down a little. Move the coals around so one part of the fire is hotter. Clean your grill grate with a wire brush after it gets hot. You're ready to cook. Make the pesto by picking the leaves from a lot of mint (for a cup or so of walnuts, use about 2 cups of loosely packed mint leaves). Blitz the walnuts in the food processor* with a couple of garlic cloves, then add the mint, about a half cup of extra virgin olive oil to start, and about a half cup of grated pecorino romano cheese (or Parmigiano Reggiano or a mix of both). Add a pinch of salt and process until smooth, adding more oil if the mix seems a little dry. Cut a head of green cabbage into quarters, keeping the core intact so the pieces hold together. 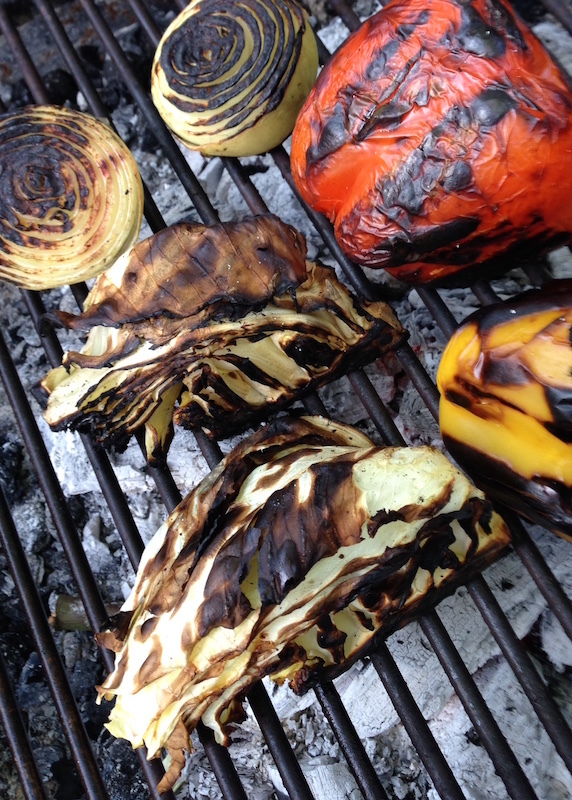 As usual, the grilled vegetable manifesto applies, so no oil on the cabbage. 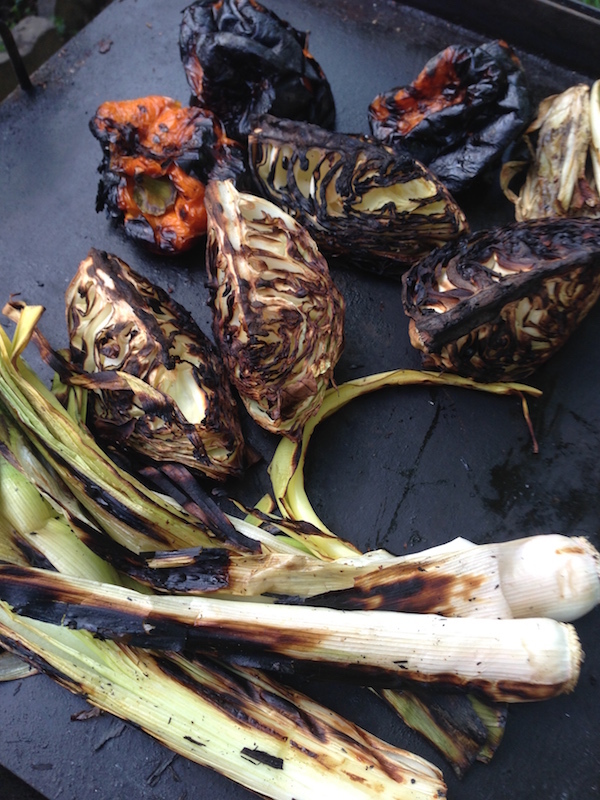 Cook the cabbage pieces over direct heat (right over the hot coals), turning occasionally until they're nicely charred on all sides. Move the cabbage to the cooler part of the fire while you cook other stuff (if you build a fire, you might as well cook everything over it). Serving the charred wedges whole is more dramatic, but chopping them up makes for easier eating. Either way, pour some good extra virgin olive oil on them and serve with a big dollop of the pesto.